The cure for the common classroom? More myelinization! A Friday morning in the TRiO Student Support Services lab find four groups of Anatomy and Physiology students studying and working together with a tutor. Northeast State faculty members Dr. Brent Lockhart and Dale Ledford circle the classroom giving their time assisting tutors and furthering discussions. But the session belongs to the students. Theron Booher tutors students in anatomy at the TRiO Lab. Tutors lead groups of three to four students on a variety of anatomy and physiology topics. The tutors explain anatomy while connecting the subject to a visual cue such as moving their arms or legs to demonstrate the aspects of anatomy. Each student gets a turn in the role of professor guiding his or her group. Given the sheer amount of information students must learn, Anatomy and Physiology ranks as the most challenging subject health-related professions majors face during the first year of college. The subject is divided into two semester long sections and is required for all health-related professions majors. The TRiO hosts the Anatomy and Physiology tutoring session at the TRiO Lab in the General Studies Building. TRiO Director Teressa Dobbs suggested moving the A & P tutoring sessions to the TRiO Lab earlier this year. The thought helps TRiO students enrolled in health-related majors and give A & P students a set time and place to get tutoring assistance. “We volunteer our time, TRiO allows us to use their lab, and the students get a place to increase their knowledge through each other,” explained Lockhart. Booher referred to the tutoring process as “more myelinization”. Defined in Dorland’s Medical Dictionary, myelinization is the act of adding myelin sheath around nerve fiber. The result is a faster, cleaner movement of information across the nerves synapses – a good analogy of how group tutoring shares information with peers and develops a student’s understanding of a subject. 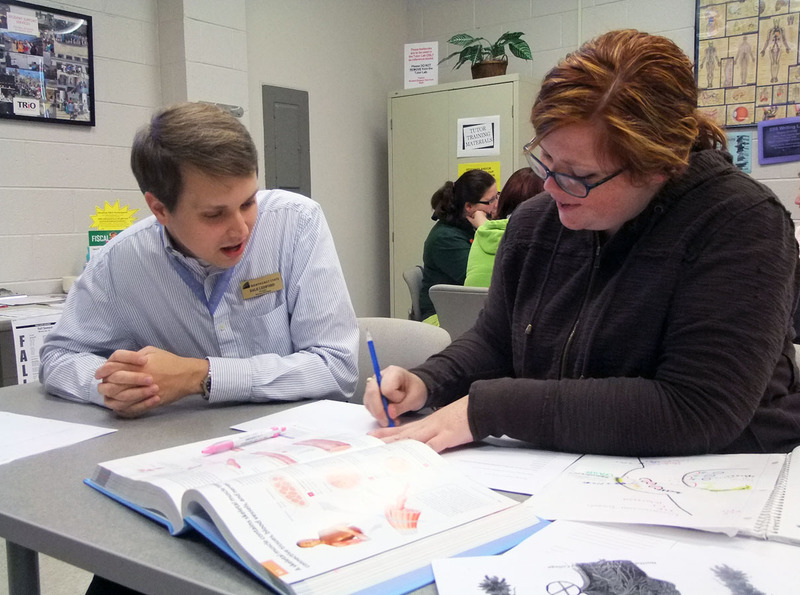 Professor Dale Ledford lends his time to help anatomy students. 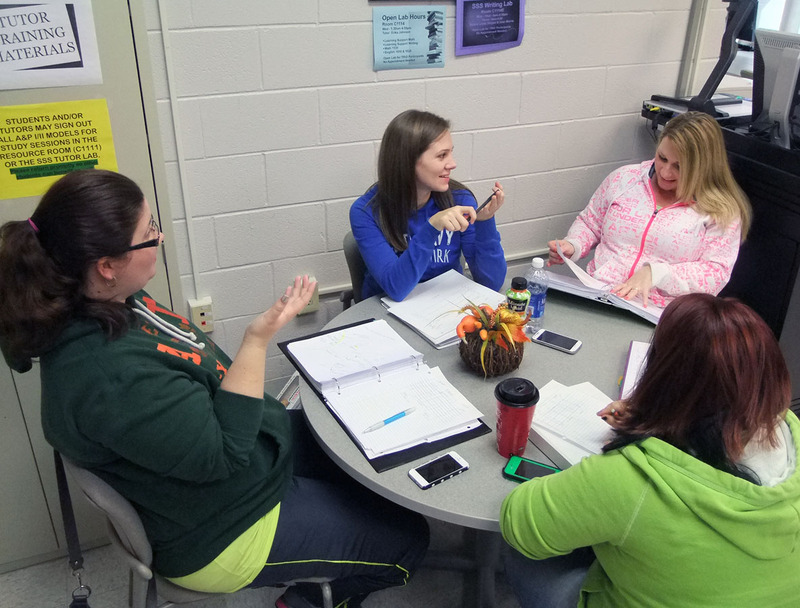 April Hodges, a TRiO student taking part in the tutoring sessions, said the group learning environment not only gave her a more intense understanding of anatomy definitions but how they worked as a system. As the first member of her family poised to earn a college degree, Hodges also praised TRiO for helping her adjust to college life. “The group setting gives you the back and forth communication that helps look at the subject and understand how everyone else learns it,” said Hodges, a Nursing major. Lockhart added the rotating roles meant every student became a pseudo-professor for the group. 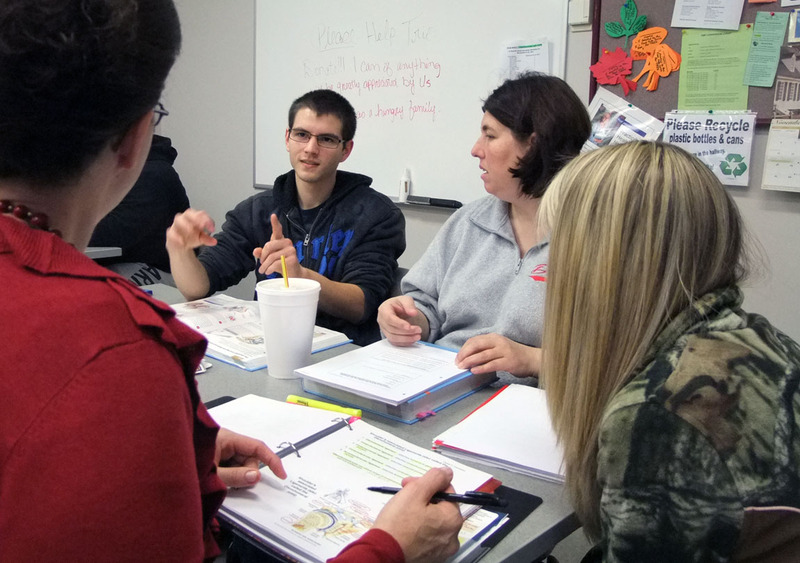 The A&P tutoring model gives students the chance to be professor and student while helping their classmates learn the material. Rita Muller heard about the tutoring opportunities in Dr. Lockhart’s A&P I class. She jumped at the chance to improve her knowledge of the subject. The TRiO Student Support Services program is a federally funded grant program designed to provide an array of free services to limited number of eligible students each academic year. Lockhart said the program’s willingness to lend their space and time was instrumental to his department’s work with students. Northeast State wants to help future college students discover financial aid opportunities by hosting Sullivan County Financial Aid Night on Thursday, Nov. 29 from 6 to 8 p.m., in the Wellmont Regional Center for Performing Arts at the main campus, 2425 Highway 75, adjacent to Tri-Cities Regional Airport. Sullivan County Financial Aid Night happens Nov. 29 at Northeast State. High school students and their parents attending the Financial Aid Night will learn how to complete the Free Application for Federal Student Aid (FAFSA) form to apply for federal and state aid. Northeast State staff members will present information about the Tennessee Education Lottery Scholarships and other state programs available to students. Staff members will also have information about the Educate and Grow Scholarship Program, Northeast State institutional scholarships, and other financial aid opportunities. Representatives from the following institutions have been invited to attend: Carson-Newman College; East Tennessee State University; Emory and Henry College; Tennessee Technology Center; King College; Tusculum College; Milligan College; University of Tennessee at Knoxville; Northeast State; Virginia Tech; Virginia Intermont College; and Walters State Community College. The event is sponsored by the Northeast State office of Financial Aid. For more information contact 423.323.0252 or e-mail FinancialAid@NortheastState.edu. 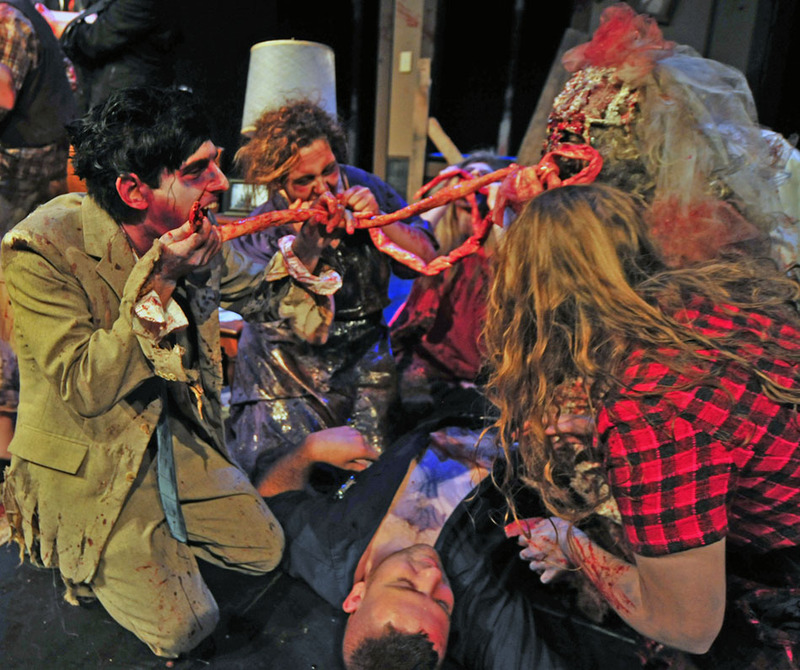 Northeast State Theater’s Night of the Living Dead proved to be a big hit with audiences. The production also won over the critics earning several students and the play’s director nominations for their work from the Region IV Kennedy Center American College Theater Festival (KCACTF) judging body. Student earning nominations were: Anne Rowell and Richard Jackson (Acting); Aaron Bradley (Scenic Design and Sound Design); T.J. Laws (Costume Design); Richard Curtis (Makeup); and Amanda Neas (Stage Management). Region IV judges also nominated Northeast State’s Brad McKenzie for the Faculty Directing award. Based on the classic 1968 zombie film, McKenzie merged stage action with brief television news clips shared by the audience and cast creating an element of drive-in movie nostalgia. The play’s tension swept audiences into an apocalyptic vision being played out in a living room. The play ranks as the Northeast State Theater’s second most popular production ever staged only trailing last spring’s production of The Wizard of Oz in the number of ticket sales. Actors showing off the work of T.J. Laws and Richard Curtis who were nominated for their work in costume design and make-up, respectively. With the action set mostly in a rural Pennsylvania farmhouse during the late 1960s, Laws researched the look of that era’s clothing. He coordinated the characters’ style with Curtis’s make-up effects. “Richard and me worked to match costuming and masks trying to match up every detail,” said Laws. Curtis identified each actor playing a zombie – milkman, paperboy, and bride – then custom designed each mask to fit each the character’s identity and the actor’s face. He created the mask structure with a combination of latex and silicone. The masks were later painted and garnished with the grotesque zombie features. Bradley’s design contrasted the house’s off-stage upstairs area to on-stage cellar for dramatic effect. He framed the on-stage cellar area like a grave, dark and inescapable. The home’s upstairs area stayed off-stage and unseen, suggesting an unknown fate and a possibility of hope. Aaron Bradley’s scenic design of a lonely farmhouse and sound design of marauding zombies won over critics and audiences. “I looked at a lot of farm houses from the 1940s because the house was dated back to that time,” said Bradley, who also played the character “Tom” in the play. 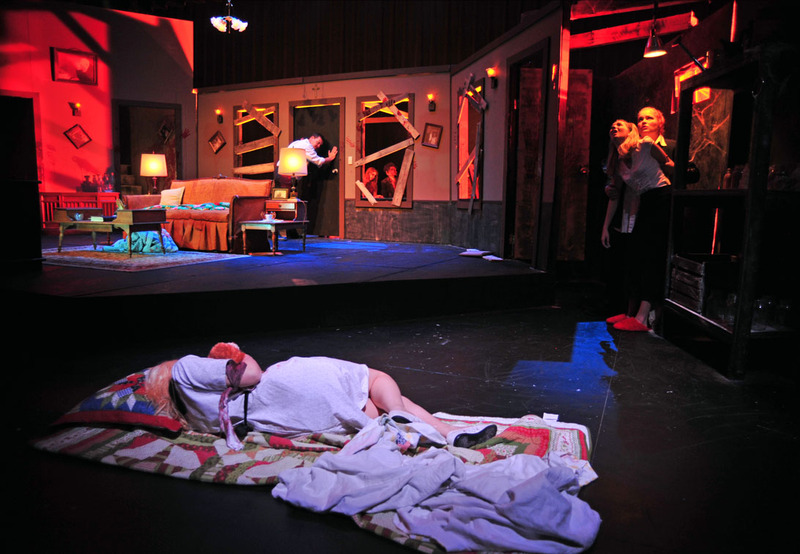 After using her talents as an artist and designer in past productions, Neas took on the formidable task of stage manager for Living Dead. This new role meant long hours coordinating actors, designers, props, zombies, sounds, and stage cues to keep the production flowing. The work of Neas and Curtis caught the KCACTF judges’ attention for the second consecutive year. Neas won a first-place award last year in the festival’s Weiss Design Competition for Lighting Design for her designs of Equus. Curtis earned the Barbizon Scenic Design award for creating the Oedipus character masks. He was also nominated by the KCACTF judges for his scene design work on the Godspell production done by Northeast State Theater in spring. 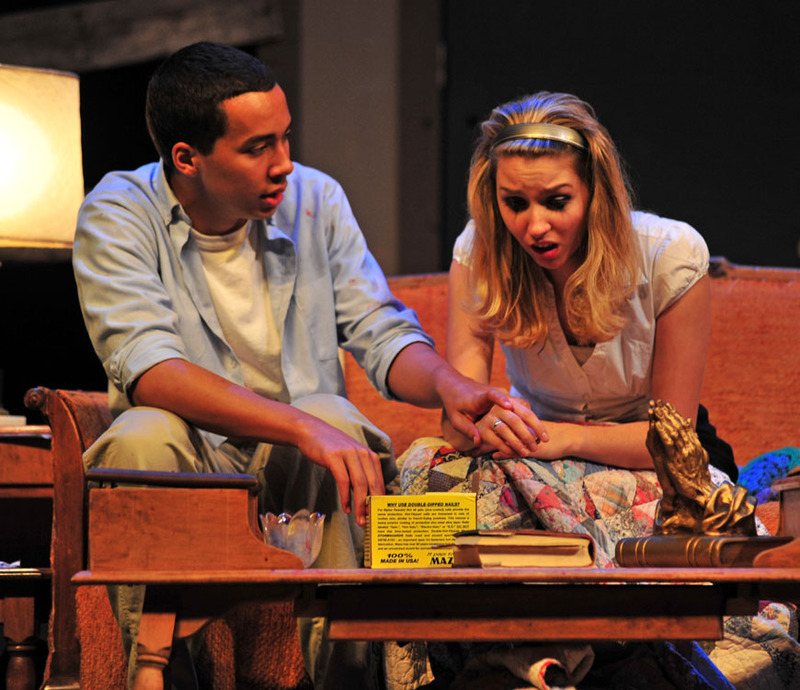 The Kennedy Center Theater Festival recognizes the best theater work in Region IV representing colleges throughout the Southeast. McKenzie has won multiple Region IV awards and competed in the national Kennedy Center Theater festival. Actors Richard Jackson and Anne Rowell were nominated for their performances. A proctor from Region IV attended a performance to assess the play. The production’s quality was graded and then considered for nominations to the regional competition. The KCACTF Regional Festival gives each nominee display space to exhibit his or her work. Judges review the work as it fits into the overall production. All the nominees will travel to the Region IV festival competition in Albany, Ga., next spring to compete against theater programs from across the Southeast. Echoes and Images, Northeast State’s award-winning Student Literary Magazine, invites submissions for the 2012-2013 competition. The competition is open to current students at Northeast State. All entries must be original and previously unpublished, in print or online. Entry deadline is Dec. 10. 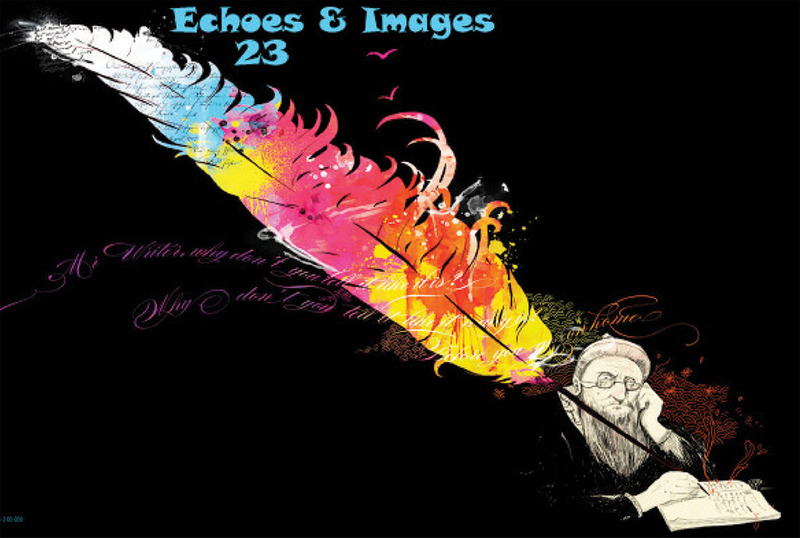 Echoes and Images 23 wants your art. Categories are: Poetry, Fiction, Non-fiction, and Visual Art. Judges review submissions in each category and name winners. First place is awarded a $50 cash prize, second place wins $35, and third place winners take home $25. Find the money at the free Scholarship Tips Workshop to help students apply for 2013-14 scholarships. The week’s first workshop happens Nov. 14, 10:30 a.m.-11:30 a.m. in Basler L226 on the main campus at Blountville. The second workshop is set Thursday, Nov. 15, 12 noon to 1:30 p.m. in Room G108, Northeast State at Gray teaching site, Dillon Court. 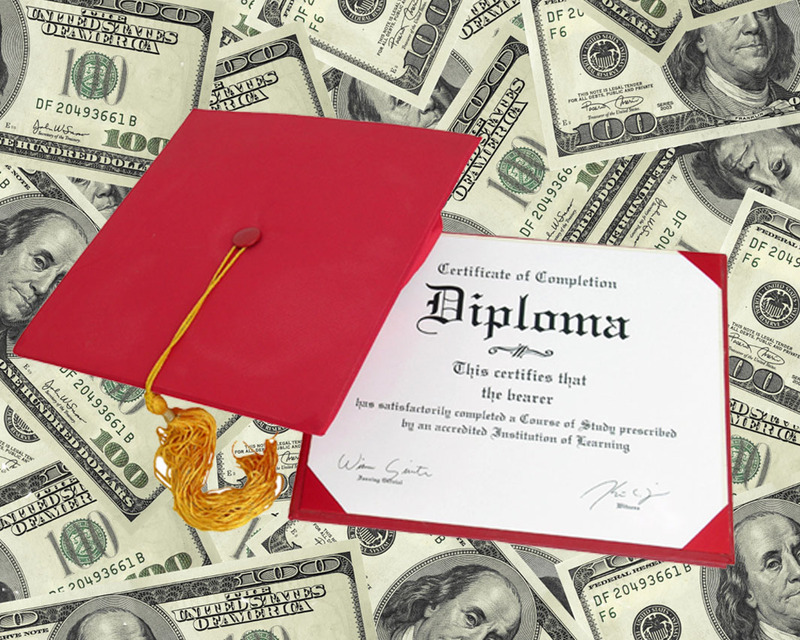 Get information about scholarships available, financial aid, application deadlines, supporting documentation and formats, writing the scholarship essay, and the Northeast State Honors Programs. The Scholarship Tips Workshop is sponsored by the office of Scholarship Programs.